rod to the deadmen. Thoroughly clean the tie rods and turnbuckle by removing rust and corrosion. Repairs may be made by welding new rods onto the corroded area (fig. 7-20) or by installing new rods from the turnbuckle to the face of the wall or outside of the wales. Check the condition of the deadmen and either make necessary repairs or strengthen them as required. Tie rods should be replaced or repaired one at a time. Coat new work with bituminous material, wrap with fabric tape, apply another coating of bituminous material over the tape, and then backfill the trench. Wood pile and timber structures in a marine environment are susceptible to infestation and attack by marine organisms or wood rot spores. Therefore, treated piles and timbers should be used in the repair or replacement of such members in structures, unless there is a specific reason for doing otherwise, on the basis of the economic expected life. Southern yellow pine, Douglas fir, and oak have been found to be most suitable for waterfront structures; however, hemlock, larch, spruce, cedar, and tamarack can be used. Bolts, washers, spikes, driftpins, and other hardware used in repair of timber members must be heavily galvanized. Figure 7-20. - Repair of tie rods. covered, inaccessible structural framing. Usage and wear from traffic is generally the cause of deck repair and replacement. Top surface decking over which vehicular and pedestrian traffic passes should be replaced when the top surface becomes excessively uneven, hazardous, or worn to a point of possible failure of the decking. Replacement should be with edge-grain timber, surfaced on four sides. Decking should be laid with 1/2-inch to 3/8-inch spaces between each plank to permit ventilation and drainage. The top surface should be reasonably smooth and level, particularly where repaired areas meet existing decking. End joints should be staggered where existing and new decking meet. Decking should be nailed securely at every stringer with 6-inch spikes for 3-inch decking and 7- or 8-inch spikes for 4-inch decking. Spikes should be driven flush with the top deck planking. Care should be taken to rebuild the openings or access for underpier fire-fighting nozzles or sprayers and for access to piping, valves, and fittings into the repaired decking area. Decking for relieving platforms that have an earth fill should be a double layer of pressure-treated lumber laid without spacing between planks. Stringers that have rotted or have been damaged should be replaced. Replacement stringers should be tightly bolted where they lap with existing stringers that are to remain, and they should be pinned or bolted down to caps. Stringers that extend continuously for the length of the pier may be replaced in part by splicing to sound parts of the timber. Splices should be placed directly over pile caps, and the splices in adjacent stringers should be staggered where possible. A typical splice for a 12-inch by 12-inch stringer or cap is shown in figure 7-21. 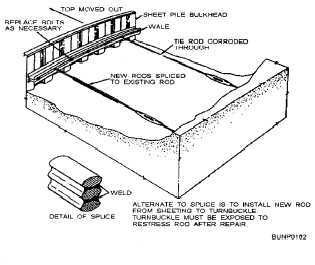 Pile caps that require replacement because of rot or damage should be completely replaced between the splices of the original structure. Bolt holes in new caps should be carefully made to align properly with bolt holes in existing caps. It is preferable to use new fishplates, particularly if they are of timber.